the anther cone, which usually completely surrounds the female parts. The source of pollen, Depending on cultivar or cultural conditions the stigma might exert outside of the anther cone. okay with the Botany lesson? let's move on. 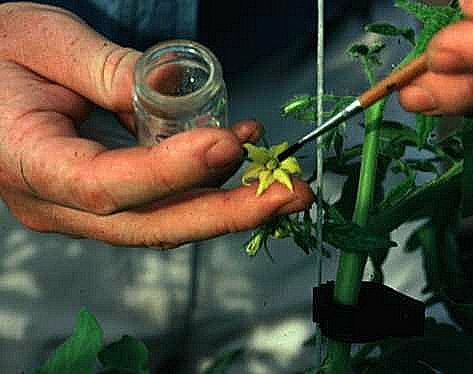 First,one needs to start emasculation (removal of the anthers) by locating a flower which has not opened yet. If opened, it is likely that the flower self-pollinated, and it would be to late to make crosses with this flower. The right stage will be a flower that is just about to show yellow prior to opening. You may have to observe this for a few days to understand what to look for. Once a proper flower is located, carefully remove the anther cone (the petals will come with it) by pinching the side of the anther cone with tweezers, hold the base of the flower at the pedecil and pull straight out to eliminate the possibility of damaging the pistillate parts. One can do this easily by hand with some patience and practice. Just make sure that the stigma and style do not break. I find doing so quickly and directly works best. 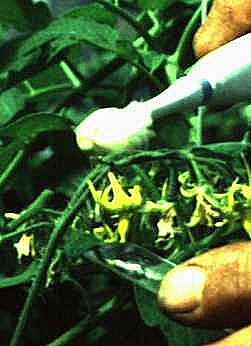 (Practice removing anthers on opened flowers). The pedicel, the sepals and the pistillate parts should be intact (the "green" parts). The stigma isn't quite ready yet so you'll need to wait another 24-36 hours before crossing. It will become sticky when receptive. Since most of you will be doing this outside, you may want to loosely cover the emasculated flower overnight with cheese cloth (or some other "breathable" material) to protect it from insects and the possibility of it picking up unwanted pollen (and to mark it). Be Careful not to cause damage to the style or stigma! You could begin collecting pollen right then or wait till the next day. If you begin then, remove anther cones from opened or partially opened flowers from the other plant you want to cross (the male parent). Allow these anthers to dry out, if needed, so that they will open up to release pollen (on glass). Or just collect pollen then and keep it cool and dry till tomorrow. It might be best to do so in a small glass vial so one can easily remove the pollen for crossing later. Otherwise, if waiting till the next day, get a slide or the end of your finger placed under the opening of the flower to catch pollen, Tap the flower to release the pollen (an electric toothbrush works well for this). You can facilitate pollen release by cutting a slit in the anther cone. Under humid conditions pollen might not fall out. It may be best to try both methods to have pollen ready. Do not force the anthers dry in the oven etc.. it will probably kill the pollen. Do so in the sun or under an incedescant lamp that is at least 18" away from the pollen. Pollen can now be transferred to the stigma by a number of techniques. I use watchglasses or my finger. A brush, straws or dipping the stigma onto a slide containing pollen works as well. Slides work well when you do several parents for pollen because one can wash them off between crosses unlike having several types of pollen on a brush or fingers. One can also cover an emasculated flower with a split open anther cone to transfer pollen. Make sure to get plenty of pollen onto the stigma to ensure good seed set and be patient so you don't damage the pistillate parts. You should begin to notice the ovary enlarging (the fruit developing) in a few days. If pollination and subsequent fertilization don't occur the flowers will abort and abscise. You can almost expect this to happen so be patient and attempt may crosses in order for a few to take. You should mark the crossed flowers immediately to identify them at harvest. Some methods, carefully cut off two sepals to mark crossed fruit as opposed to self-pollinated ones, using bread bag twistems loosely tied around the peduncle or use pricing tags (the kind with strings) and attach them to the petiole (the stem that attaches that fruit to the plant). With this method one can indicate the parents on each side of the tag and write the date of crossing. To differentiate sexes always put a "X" on the side of the female; ie "Stupice x" one side and "Brandywine" the other. This is good if using the same female parent plant for several crosses. Remember to use permanent markers though. But most of all just choose something that will not restrict growth. You could remove other fruit if you want but it is not absolutely necessary. 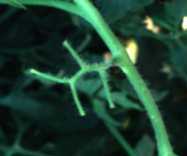 That would direct more energy to seed development in your cross but you wouldn't get more tomatoes to eat that way. Which ever, DO MARK THEM somehow. Make sure to give the plants good care from then on. Which plant one chooses for a male and which for the female often has little consequence for what most of us are trying to achieve. [IE Stupice x Brandywine vs Brandywine x Stupice (called a reciprocal cross)]. There is what is called the maternal effect. This is the result of DNA present in the chloroplasts of the mother plant (called cDNA). Cholorplasts from the mother plant are transferred to the developing embryo via the ovary. Embryos do not receive cDNA from the male. This can be utilized by plant breeders but most of us would not be aware of such differences and reciprocal crosses to make F1 hybrids USUALLY are fairly similar. If you have time/room, try both. The seed one gets from the initial cross is refered to as the F1 hybrid. Seed from self-pollination of those plants, the F2, should segregate to look like the original parents or a mix of both (depending on what traits you look at) . One could "backcross" the hybrid (or any subsequent generation for that matter) to one of the original parents or allow the plants to self-pollinate and select from those. It generally takes about six generations from the last cross to obtain a stable, "true-to-type" line one can call their own. For further reading on crossing and genetics I'd suggest "Breed Your Own Vegetable Varieties"